BIG BLUE WAVE: Personhood is Beside the Point? Personhood is Beside the Point? Who gives a damn if a human being is forced to die? The real purpose of an abortion is to kill the fetus. 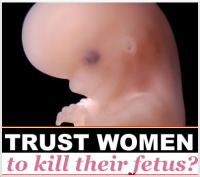 Let's perform this thought experiment: suppose it were possible for a fetus to survive a first trimester abortion. And suppose an abortionist performed an abortion, but the fetus survived. Would the abortionist have done his job? There's a reason why live birth is considered a complication of late-term abortion. Bodily autonomy is the only argument poor-choicers have. And what they argue in essence is that if my own equal, preborn child has to die in the name of my autonomy, then so be it! Kill the human being! Who cares! It's a very dangerous argument. I can hear the objections: well so is denying bodily autonomy argument. Okay what's the scarier argument? That one must deny one's bodily autonomy for nine months in the name of preserving human life that one has created? Or that another human being must die in the name of bodily autonomy? Clearly, the scarier scenario is human beings being forced to die. The slippery slope is far more dangerous in this case. Bodily autonomy can always be regained. A lost life cannot. Pro-lifers do value their own bodily autonomy. And the fantasy scenario that women will be made to breed is simply unrealistic. But the scenario that the strong will force the weak to die is far more likely. And it's already happening through euthanasia. Kelly McParland has an interesting rebuttal to Borovoy.